If you're still on the hunt for amazing gifts this Christmas, make your next shopping stop one of Silver Dollar City's craft locations and pick up a handcrafted item that's sure to bring joy to anyone on your list. Associate Craftsman at Hazel’s Blown Glass, Sam Aldridge loves a test. 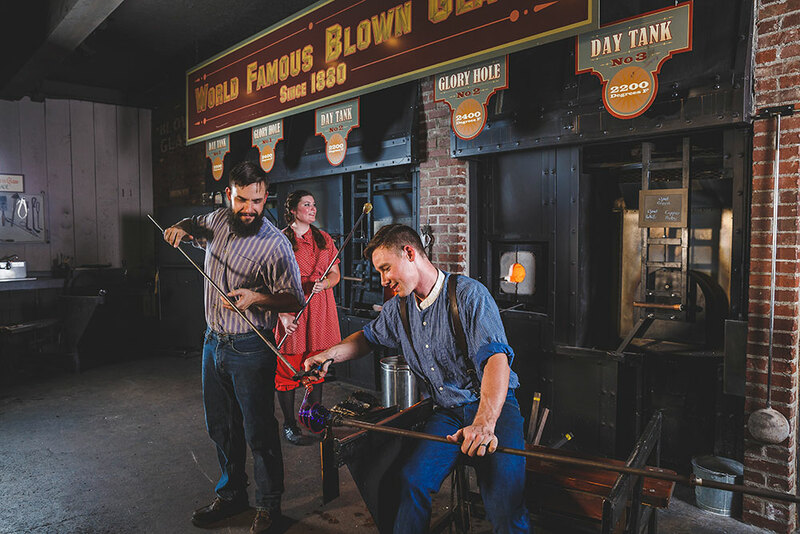 Blowing glass, a test of skill at 2200 degrees, presents challenges with heat, movement and fragility. But afterward, “you feel on top of the world,” he says. Sam took a class in glass blowing and decided immediately that he had found his new career. He has always enjoyed working with his hands and loves being a craftsman, which he says combines the best of both form and function. Stop in at Hazel’s Blown Glass during your visit and see some of the latest creations that Sam has been working on, especially for the Christmas season! Explore the many Christmas trees filled with glass ornaments, made by Sam and the other glass blowers, to deck out your Christmas tree this year with beautifully handcrafted, glass ornaments. Or stop in to pick up a blown glass snowman figurine! Sure to last longer than an actual snowman, these darling glass pieces will bring the fun of winter into your home all season long! Don’t miss the chance to add an extra layer of magic to Christmas this year when you take home a handcrafted piece from Hazel’s! If visions of sugarplums are dancing in your head, your first stop this Christmas season needs to be Brown’s Candy. Located across from the Blacksmith shop on Valley Road, this magical shop will make your wildest candy dreams come true. From jars of candy sticks to bags of peanut brittle - and let us not forget about the delectable chocolate treats - the sweet tooth of everyone who steps in the door will be overjoyed at the sight before their eyes. And, while there may not be actual sugarplums in the shop, you sure can come close when you taste one of over 15 different flavors of fudge! Just one bite of the classic chocolate fudge will have your fondest Christmas memories rushing back. Or gather up the kids to try the S’mores fudge to make new Christmas memories! 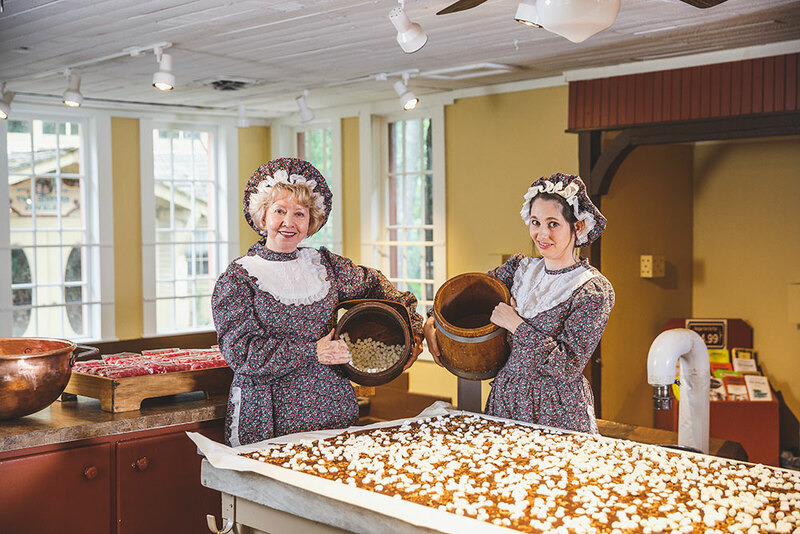 Plus, watch the Candy Craftsmen at work while they make fresh fudge right before your eyes. Head over to Brown’s today to wrap up this Christmas season in the sweetest way! Are you having a hard time deciding what gift to get for people on your Christmas list? A handcrafted mug from Hillcreek Pottery is the perfect Christmas present for anyone. With five different glaze colors and three different mug sizes, you can rest easy knowing that each person will get a mug that is sure to suit them! Just imagine drinking a cup of hot cocoa on a snowy day out of these gorgeous mugs! Each mug is handcrafted right here on park by talented craftsmen, like our very own Amanda Connor and Christopher Kinney. Both Amanda and Christopher discovered their knack for pottery while in college. While neither of them had tried pottery before, it did not take long for them to fall in love with the craft. Being able to be fully immersed in the craft and create something out of nothing that people will use and admire for years to come, is one of their greatest joys as craftsmen. 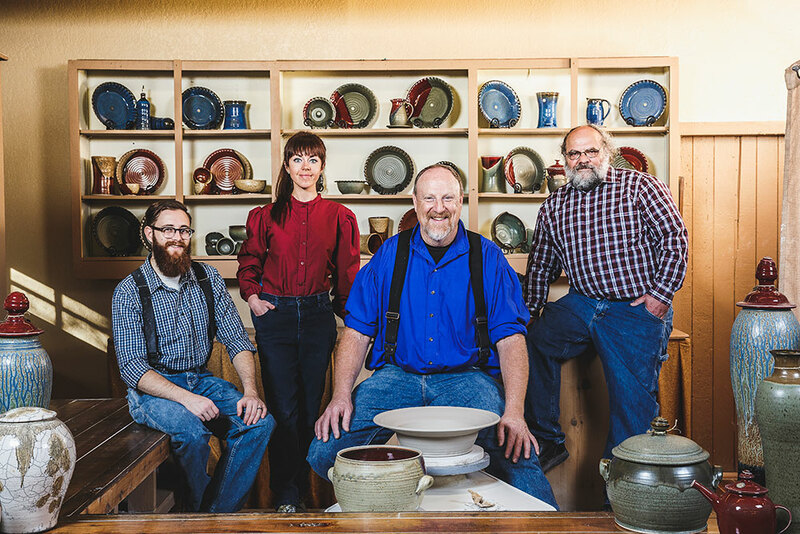 Come visit with the crafters at Hillcreek Pottery while they demonstrate and hear their stories and pick out that perfect present!